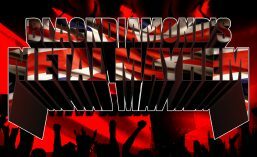 Blackdiamond’s Metal Mayhem on Tuesday 15th January was on air at the usual time of 6PM GMT on http://www.totalrock.com. Featured on the show – a great selection of rock and metal tracks by bands from around the world as always, including FULL HOUSE BREW CREW, THE END MACHINE, EVERGREY, CRAWLER, BEAST IN BLACK, CELLAR DOOR MOON CROW, DARKWATER, PROMETHIUM, DEMONIC RESURRECTION and many more! Two META(L)SCOPES were featured – from Dutch metal legends MARTYR and Swedish metal giants SOILWORK, highlighting several tracks from their albums. Check out the full Play List, now available to listen to again here. This entry was posted in Radio Shows and tagged Blackdiamond's Metal Mayhem, Martyr, META(L)SCOPE, Soilwork, TotalRock. Bookmark the permalink.